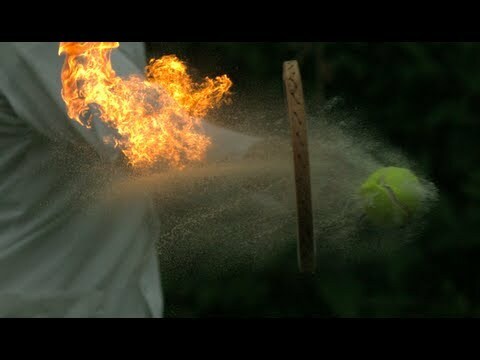 It might never have a chance of becoming an Olympic sport for more than a dozen obvious reasons, but there’s plenty to be excited about the next step in the evolution of tennis – Fire tennis, invented by video game designers and perfected by the slow mo guys. The idea? Pretty simple. Take a tennis ball, dip it and soak it in gasoline or petrol, depend on what kind English you speak, and start swinging away. Problems? Well, you’ll need protective gear, for your entire body, guessing that pretty quickly you’ll start getting petrol sprayed all over you. The ball-replacing ratio would be way too high; the burns on the hard and grass courts will be impossible to remove, and that’s without even mentioning the danger to the spectators. The next step in the evolution of tennis? Probably not. But a hell of a fun way to pass the time in your back yard and kill and afternoon with friends. Lighting things up and playing sports has never been as fun – the perfect solution for the pyromaniac health nut.